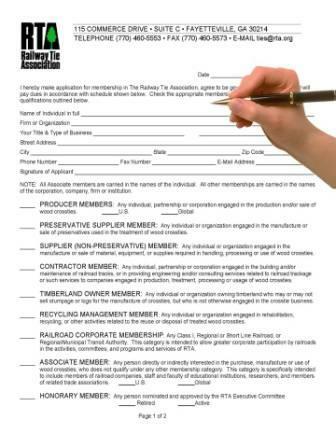 You can view a copy of our Membership Application, which explains RTA's membership dues and structure. Once you know which category of membership you fit under, click on this link for the on-line application. After we have reviewed your information, we will notify you that we have approved your membership application. If you wish to become a Producer Direct, Preservative Supplier, Non-Preservative Supplier or Contractor member, please complete the Membership Survey. You can also email the interactive version of the Membership Survey directly to us by clicking on our email address at the bottom of that form. The information you include on this survey will help to better describe your company's programs and services we list in the membership directory which we publish every fall.